There are few waterways as alluring as the Seine. Combine this with beautiful Bordeaux and the rural charm of Portugal’s Douro Valley, and you can look forward to a trip that is as wondrous as it is diverse. From beautiful vinelands to spectacular limestone cliffs, dramatic cathedrals to ancient stone churches, wonders of every degree await. Experience a spectacular array of wines, from Bordeaux’s Grand Cru Class vintages to Portugal’s renowned ports. Witness the sun going down behind the open waters of the English Channel and toast starkly contrasting sunsets among beautiful valley hills. 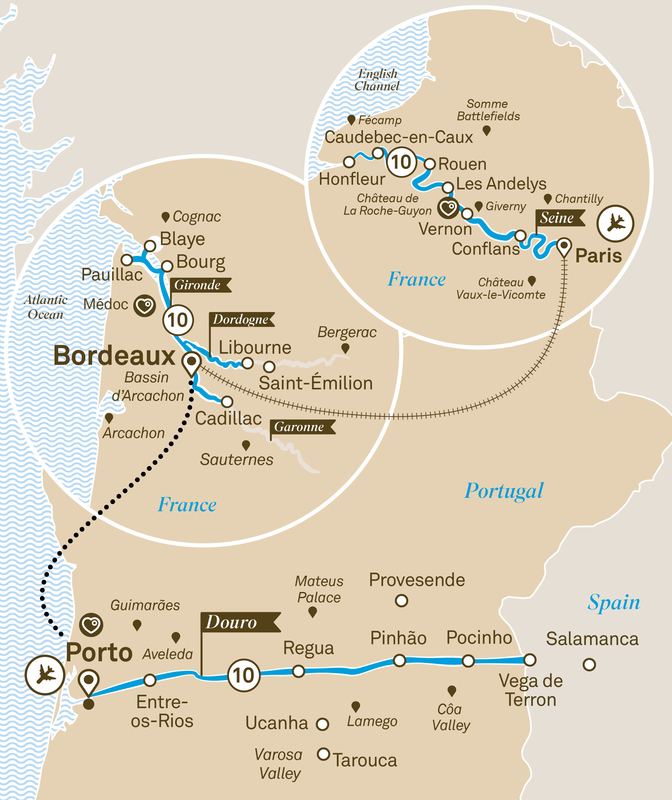 Today, transfer to Bordeaux Airport for your flight to Porto where you’ll board your Douro River cruise.